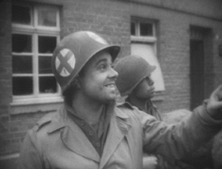 This DVD about the 104th Infantry Division takes place in World War II during the Winter of 1944 and the early months of 1945 in Europe. , was fighting in the VII Corps of the US First Army. 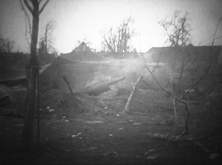 The division was continuing to clear the Eschweiler, Germany sector. 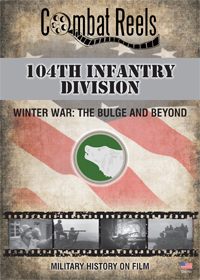 Winter War: The Bulge and Beyond DVD begins here and continues through to late-March 1945 as elements of the 104th Inf. Div. push into Cologne, Germany. 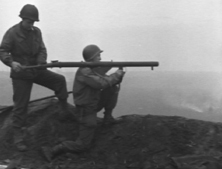 The contents of this video show the action as was recorded by the 165th and 167th Signal Photo companies during these historic operations. 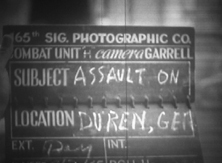 The footage in this video is intended to be strictly that of the 104th Division and only shows other unit footage when two or more units are intertwined. 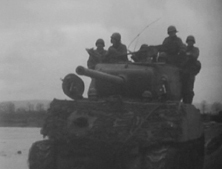 Combat Reels has located, researched and compiled all of this raw combat film footage, then reformatted it into the DVD format for your viewing pleasure. 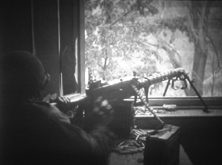 Some of the scenes included on this 104th DVD are of the fighting near Düren, Germany. Field Artillery units fire shells filled with propoganda leaflets. 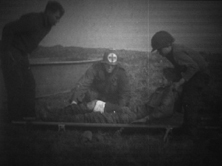 Medics dig civilians out of collapsed buildings after and aerial bombing. Men of the 104th attack across the Roer River into Düren. A Nazi SS labor camp is liberated at Arnoldsweiler. The 104th moves through Cologne as it pushes to the Rhine, and Much Much MORE!! Enjoy the close up shots of the actual locations the 104th Infantry Division fought for and occupied. 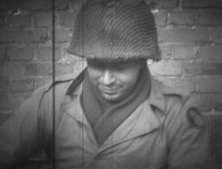 Examine as well the the equipment, vehicles, weapons, uniforms, helmet markings and the faces of the men themselves on these candid reels of history. Artillery Units of the 104th Division fire propaganda leaflets near Durwisse, Germany. Soldiers of the 414th Infantry ride tanks near Düren, Germany. 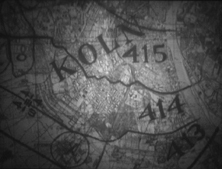 A close-up view of the combat map used in Cologne. Solider of the 104th Sits and takes a break from ht fighting near Weisweiller, Germany.